In my last review, I talked about the country fried steak sandwich that I had at E's 24 Hour Cafe. At the time, I never before had a fried steak sandwich and figured it would take another fifty years before I would even find another restaurant serving it. Lo and behold, it took all of one month before finding another one in the most unlikely of places, a Mexican taqueria. Most people, whose familiarity with Mexican food goes no further than tacos, burritos and nachos, might assume that the sandwich is a gimmick for appealing to American tastes but that isn't true. Like with the Somali spaghetti I had at King's Grocery and Deli, the Mexican torta has roots from Italians who introduced it to South Americans as "Cotoletta alla Milanese" in a more traditional manner (in other words, not as a sandwich). Although I never ate a fried steak sandwich during my times in Italy and the Western U.S., I was anxious my first "foreign" fried steak sandwich. 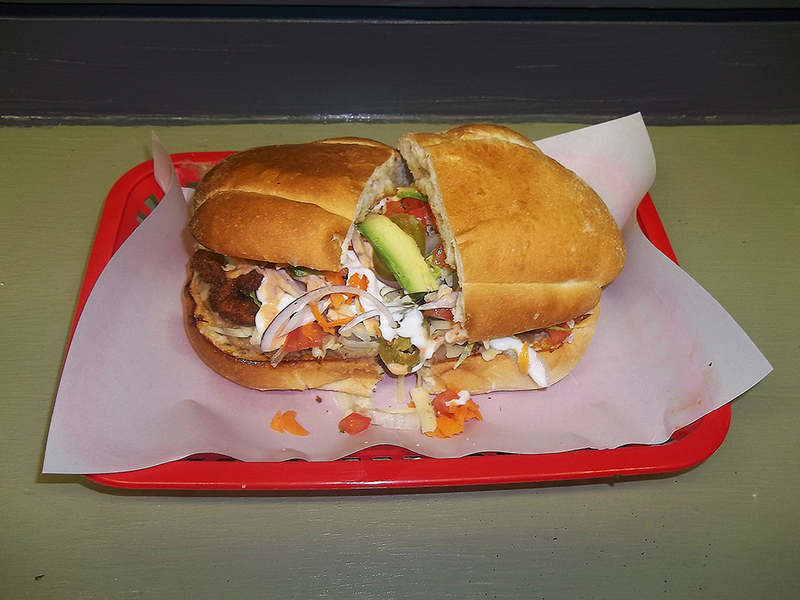 The Milaneza (according to Google and Wikipedia, the actual spelling is "Milanesa") consists of a thin slice of "shallow-fried" bread crumb crusted steak and topped with sour cream, cheese, mayo and an assortment of veggies including avocados and jalapenos. Unlike the bland sandwich that I had at E's, the Milaneza was lively and tasty, making for a great lunch when I ate it with tortilla chips and guacamole. So, for anyone looking for genuine Mexican food, I recommend getting a torta like the Milaneza at Maciel's. 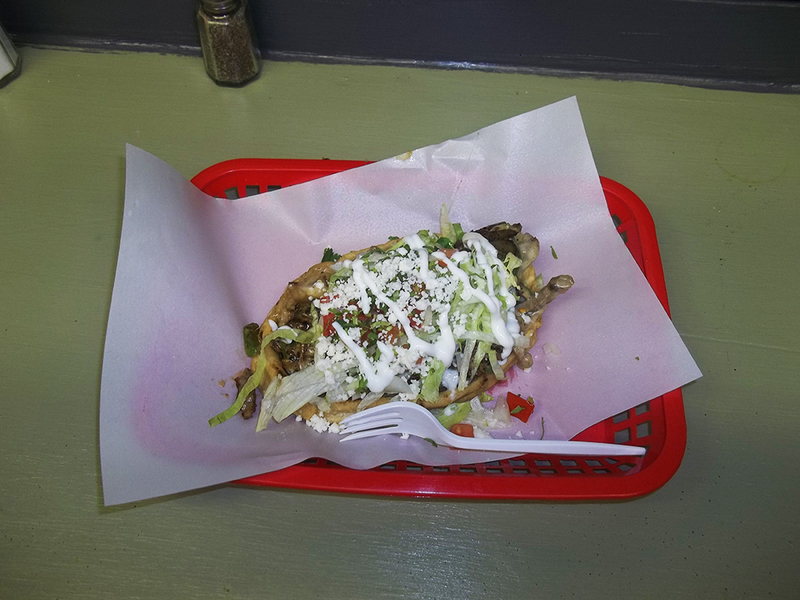 Another traditional Mexican staple that Maciel's offers is the huarache (name take from the Spanish word for sandal), a "flatbread" that looks more like an open-faced sandwich. In place of bread, the oblong-shaped dish uses fried masa (something that Maciel's does very well) that is usually topped with a meat and a variety of other things. For my first time, I got the Desebrada, a huarache covered with shredded beef, lettuce, sour cream, queso, cheese crumbs and other toppings. It's sort of like a giant-size nacho that surprisingly wasn't too messy when I ate it. Overall, I really like Maciel's Desebrada although when I get it again, I will get a side item like Elotes Con Crema (Mexican street corn with cream) to make it a complete meal. By itself, the huarache is a great snack that I hope others come to experience. It seems that Maciel's Tortas & Tacos is the real deal, and I hope it's successful. 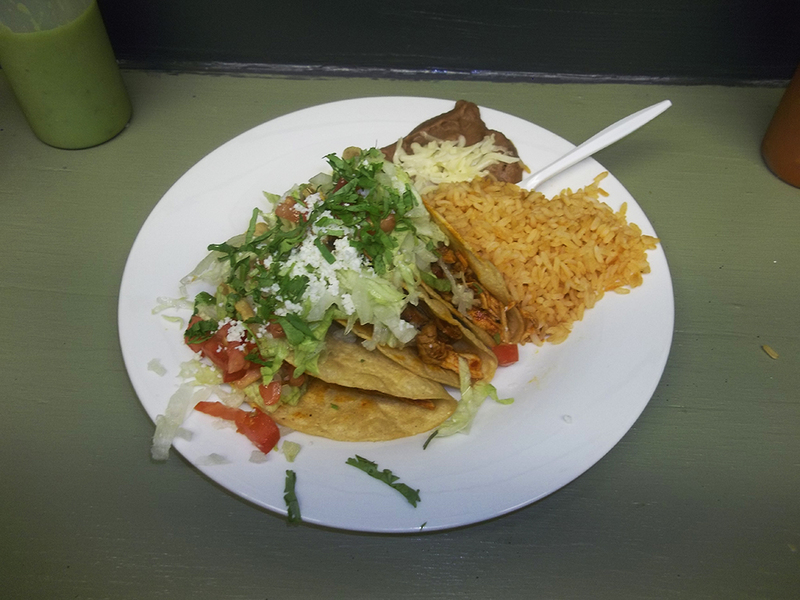 Given its location on Main Street between Union and Monroe, known for many failed restaurants, the odds are against them although Maciel's quality food (including its delicious fried tacos) gives it a better than average chance. Judging from the positive things I heard others say about Maciel's (including restaurateurs like Chef Brian Michael Patrick of Rizzo's Diner), I'm confident the restaurant will be around for a while.